October 2017 travel orientation meeting on Thursday, May 18 at 5:30 pm at O'Brien Hall, Mission San Buenaventura. Biannual visits to Loreto including hotel and non-stop flights from LAX, are meant to promote and strengthen the sister city relationship between the cities, and the cost of the trip includes a donation to support the Ventura/Loreto Sister City Committee whose objectives include collaboration on tourism, culture, education, environment, and business initiatives. The committee brings together representatives from the City of Ventura, Ventura Visitors & Convention Bureau, San Buenaventura Mission, Santa Cruz Island Foundation, Consulate of Mexico, City of Loreto, Mision Nuestra Senora de Loreto, Eco Alianza, and Sister Cities SOCAL among others. 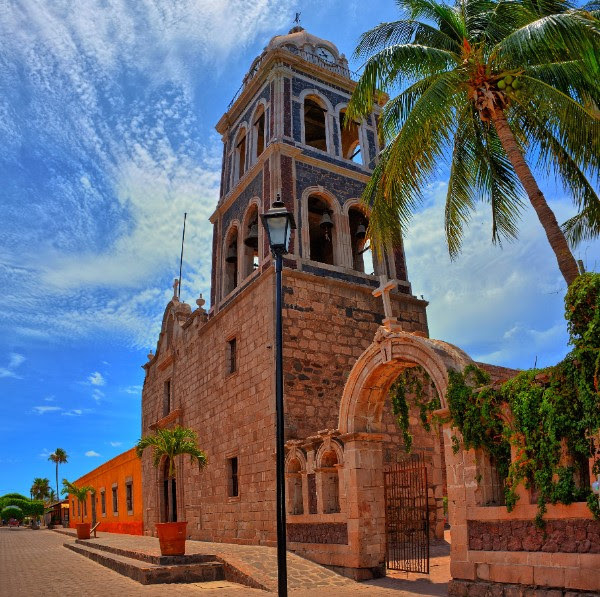 Loreto is a small city of approximately 17,000 people that sits on the east coast of Baja California, facing the Sea of Cortez. It was the first Spanish settlement on the Baja California Peninsula and is the starting point for the historic El Camino Real corridor that follows north along the ancient route of the Spanish missions from Mission of Our Lady of Loreto to Sonoma, California. From Loreto, Father Junipero Serra, who established the Mission San Buenaventura, planned his journey north to Alta California. Part of our tour will be of the mission, the first developed on the El Camino Real corridor going north along the ancient route to Sonoma, California. Where the past meets the future, this tour not only offers a peek into history, it also offers the opportunity to meet community leaders, learn more about the government and politics of Loreto and the Sister City relationship. Loreto is also home to Loreto Bay National Park where Coronado, Del Carmen, Danzante, Montserrat and Santa Catalina Islands are home to over 800 species of marine life. With breathtaking cliffs, spectacular beaches and dramatic rock formations, these islands are a perfect landscape for the ecologically-minded or those who delight in a vast array of marine life. There are efforts to create a sister park relationship between Channel Islands National Park in Ventura and Loreto Bay National Park, that will provide extensive opportunities to share science, research conservation and eco-tourism programs, and sustainable growth efforts. Trip inquiries should be directed to Stephen Joyce with Ventura Travel Professionals at 805-218-1962. Recognized as the Head and Mother of all Missions in Alta and Baja California, the faithful parishioners of Misión de Nuestra Señora de Loreto Conchó, founded in 1697 in Baja California Sur, and the faithful parishioners of Mission San Buenaventura, founded in 1782 in Alta California, commit to support each other in prayer to: witness the Gospel, cultivate our religious heritage, provide temporal resources and encourage pilgrimage to all the missions in the Californias in fidelity to Holy Mother Church, the Holy Father, our respective bishops and dioceses as Sister Missions. From Loreto, Franciscan Friar Saint Junipero Serra planned the missionary expedition north to Alta California. In 1782, he established Mission San Buenaventura among the native Chumash Indians who inhabited the coastal areas for centuries and were known as "bead maker" or "seashell people" who as hunters, gatherers, and fishermen, recognized their dependency on the world around them. The Mission by the Sea across from the Channel Islands became the ninth and last mission founded by Saint Junipero Serra. In 2015, our representatives in civic government adopted a Sister City relationship. Respectively, the two national parks off our shores have inaugurated a Sister Park/Sister Reserve Project: Bay of Loreto National Park-Channel Islands National Park and the University of California Natural Reserve System. These Sister partnerships may also support each other during natural disasters or other emergencies by raising funds or collecting needed-supplies. By sharing each other’s cultures through sister relationships, communities can gain insight into the history, values and spirit that make up their sister mission, sister city, and sister national parks and reserves. Conocida como la cabeza y madre de todas las misiones de la Alta y Baja California, los feligreses fieles de la Misión de Nuestra Señora de Loreto Conchó, fundada en 1697 en la Baja California Sur y los feligreses fieles de la Misión San Buenaventura, fundada en 1782 en la Alta California, se comprometieron en apoyarse mutuamente en rezar a: ser testigos del evangelio, cultivar nuestro patrimonio religioso, proporcionar fuentes temporales y fomentar la peregrinación a todas las misiones en las Californias en fidelidad a la Santa Madre iglesia, el Santo Padre, nuestros respectivos obispos y diocesis como Misiones Hermanas. Por siglos, Loreto fue poblado principalmente por indios pericues, quienes se sostuvieron recogiendo fruta, cazando y de la pesca. La llegada y fracaso de la colonización de los españoles en 1533 y la exitosa subsecuente llegada de los misioneros jesuitas en 1697, quienes establecieron en este lugar la primera misión de las Californias, guiada por padre Juan Maria Salvatierra, Loreto se convirtió en la capital historica de Alta y Baja California hasta 1777. Loreto es el punto de inicio del historico, El Camino Real, que continua hasta el norte junto con la ruta antigua de la misiones españolas desde la Misión de Nuestra Señora de Loreto Conchó a Sonoma, en Alta California. Desde Loreto, el padre Franciscano, San Junipero Serra, planeó su viaje hacia el norte de la Alta California. En 1782, el estableció la misión de San Buenaventura junto con los indios nativos Chumash quien habitaron las areas costerias por siglos y fueron conocidos como “fabricantes de cuentas” o “gente de concha” quienes como cazadores, recolectores y pescadores, reconocieron su dependencia en su entorno. La Misión San Buenaventura fue la novena y última misión fundada por San Junipero Serra, la misión del mar, frente a las Islas del Canal. En 2015, nuestros representantes en un acto cívico de gobierno realizaron una relación de ciudad hermana. Respectivamente, los dos parques nacionales inauguraron un proyecto de hermandad entre parques marinos: Parque Nacional Bahia de Loreto, Parque Nacional de las Islas del Canal y el sistema natural reservado de la Universidad de California. Estas iniciativas beneficiarán las grandiosas comunidades de Loreto y San Buenaventura creando nuevas oportunidades económicas, facilitando intercambios culturales y expandiendo oportunidades educativas para los residentes. Con el alcance logrado y los programas de eco-turismo, la red de negocios y social entre nuestras comunidades serán fortalecidos, beneficiando presente y futuras generaciones. Unica en esta relación es la historia religiosa de nuestras misiones, la cual es la fundaciòn y nuestra mutuo patrimonio que ha sido sostenido a nuestra comunidades por siglos. Este hermanamiento puede también apoyarse, uno al otro, durante desastres naturales u otras emergencias, recolectando fondos o viveres. Al compartir la cultura del otro, a través de relaciones hermanas, las comunidades pueden obtener una perspectiva mas profunda de la historia, los valores y el espíritu que componen la misión hermana, ciudad hermana y parques y reservas nacionales.